WWE‘s superstars returned to the Texan capital of Austin for the VERY last SMACKDOWN before the highly anticipated Hell In A Cell (which can be seen on the WWE Network for the low low steal of a price of $9.99 or FREE for the first month to NEW subscribers) pay per view this coming Sunday night. Our beloved WWE World Heavyweight Champion, Seth Rollins, once again proved that he was the man, Paige attempted to make amends to the Diva’s Champion and her side kick, Becky Lynch, and the New Day put the trauma of Monday Night Raw‘s atrocity to Xavier Woods behind them as the focused on their main event showing. What other surprises were in store for the blue go home show? Find out now!! Corporate Kane abused his dwindling authority one last time as he forced our beloved champion into singles competition against Cesaro to kick off Smackdown in hopes that the Swiss Superman would weaken Seth Rollins for his championship match on Sunday against the Demon Kane. But the plan back fired as Rollins once again proved his ability and superiority over his opponent. The match began quickly as Cesaro exploded out of the corner and was on Seth in an attempt to overwhelm him with the hard hitting quick offense that he has become known for. But Rollins narrowly escaped and for a moment, it looked as if he would strategically withdraw to the back as the priority of Sunday’s match was surely on his mind. But ever the fighting champion, Seth changed his mind and took the fight back to Cesaro. The battle that followed was fast paced and intense as both men showcased athletic ability far beyond the common man of the WWE Universe. High flying offense and agility from the undisputed future of the WWE, allowed a pedigree to be hit and Cesaro’s shoulders pinned to the mat. Seth Rollins will not be stopped as his momentum from this victory propels him towards an even bigger victory against the demon Kane. And THAT victory will end the reign of terror of the relic from the attitude era known as the Director of Operations. My how the accusations fly in the locker room of the WWE. Natalya winds up injured and everyone blames Paige. Where’s the proof?? The Anti Diva has denied it and that’s good enough for me. But she still felt the need to call out the Diva’s champion, Charlotte, and her little steam punk side kick, Becky Lynch. For some reason the Scream Queen feels the need to get the PCB band back together. Team Bella on the other hand would do anything to stop this formidable squad from reuniting and came down to continue to drive a wedge into their rivals and throw Charlotte off her game prior to her first title defense against the longest reigning diva’s champion, Nikki Bella. The genetically superior diva showed her inexperience as she fell into the Bella’s trap and demanded that their match be held right then and there on Smackdown. Paige, saw through Nikki and volunteered herself by challenging the former Diva’s champion. The match between Nikki and Paige was a physical competition that Nikki more or less dominated. she focused the majority of her attacks on Paige’s shoulder and worked to wear her down with a variety of hard hits and submissions. But Paige was no push over. She battled back and showed her resilience as she caught a couple near falls on Nikki. However, Nikki persevered and nailed the Diva of Tomorrow with a vicious Rack Attack to pick up the victory and a bit of her own momentum heading into Sunday. Some would see Paige’s challenge to Nikki on Smackdown as her making the evening about her. To them I say, have you no empathy for what Paige is going through? She said some horrid things to people she loved, words hurt. But now she is letting her actions speak, by putting her BODY on the line for Charlotte. She took a beating from Nikki that could have been a beating that the current Diva’s Champion received. Now Charlotte is 100% going into her first title defense while Nikki isn’t. It was a selfless act on Paige’s part and Charlotte should thank her for her sacrifice! Miz TV has become the premier source of news for the WWE Universe. It is the most talked about talk show in all of the WWE and it is all thanks to the Miz! The Awesome one promised us that his guest, Summer Rae had a blockbuster announcement but first he introduced the Show Off, Dolph Ziggler. The Miz attempted to make WWE’s resident heart throb see the error of his ways in how his antics with Summer had driven Lana straight into Rusev’s arms. And that his treatment of Summer made her the real victim in the whole situation. That being said, The Miz soon introduced Summer to join in the conversation and make her big announcement. Summer began with that she had proposed to the wrong man. At this point Dolph rudely interrupted and put his foot in his mouth when he told the Diva, that he just wasn’t that into her. She laughed at him and assured Dolph, that she had moved on and found a REAL man. Out comes the Sultan of Selfies, the King of Cuteville, Prince Pretty himself, Tyler Breeze! The Gorgeous One introduced himself to the chorus of an NXT chant and promised that he and Summer were about to give the WWE a much needed face lift. Ziggler then antagonized Breeze but Tyler would have none of it as he began to wail on Ziggler. The scuffle culminated in Breeze using his selfie stick to injure Dolph’s throat. A gaggle of officials rushed the ring to separate the two fighters, but it was finally a well placed Beauty Shot that finally made Dolph Ziggler see the stars. On paper, this match seems one sided with the hard hitting duo from Europe taking on the smaller Luchadores from Mexico. And in practise, this match was one sided as the hard hitting duo from Eurpoe took on the smaller Luchadores from Mexico. The odds were further stacked against the high flyers as the Bulgarian Brute completed this European coalition. The match itself did have a bit of back and forth to it as the speedy offense of Sin Cara and Kalisto at first had both Sheamus and King Barrett on the defensive. But they quickly adapted and grounded the highly acrobatic duo. Kalisto allowed Rusev to be a distraction as instead of concentrating on the threat in the ring, he was focused on the Bulgarian out side it. This over sight allowed Sheamus to hit the small Luchadore with a Brough Kick that allowed the pin fall. It was quick and ended up being good practice for the European Trio as they head into Hell In a Cell against Dolph Ziggler, Cesaro, and Neville. United they stand ready to destroy a Superman, reintroduce someone to gravity, and snuff out the light of a braggart. Poor Bo Dallas. No one appreciates a truly inspirational man and take his message for granted. How awesome would it be if everyone Bo-Lieved! Imagine all the amazing things Bo-mericans could accomplish! As he attempted to say the weird Austinites, Ryback rudely interrupted a heart felt performance by Dallas. In a joke of a match, Ryback took advantage of the fact that Dallas was no where near warmed up enough to battle. But Bo did his best and the only Suplex City Survivor unfortunately was unable to survive a Shell Shock s he was pinned and Ryback picked up a victory heading into his match against Kevin Owens for the Intercontinental Championship. I hope Kevin Owens destroys Ryback. He’s proven that he can beat the freak of nature once. After what the Hungriest man in the WWE did to poor Bo Dallas, I hope that Owens feeds Ryback till he pops. 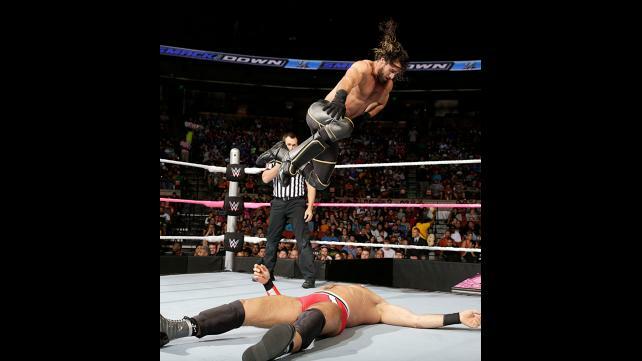 Pop Up Powerbomb that is… Bolieve that! After the traumatizing experience of seeing Xavier Woods put through a table, the remnants of the New Day were forced into a match against Dean Ambrose and Roman Reigns. How did this match come to be. Yet more abuse of power from the soon to be former Director of Operations. But the magic spreading unicorns of the WWE would not let this set back detour their powerful message of positivity as they strove to bring the power of the clap to Austin, TX. This match was back and forth. Each team getting in huge offense and using their strengths against the other team. 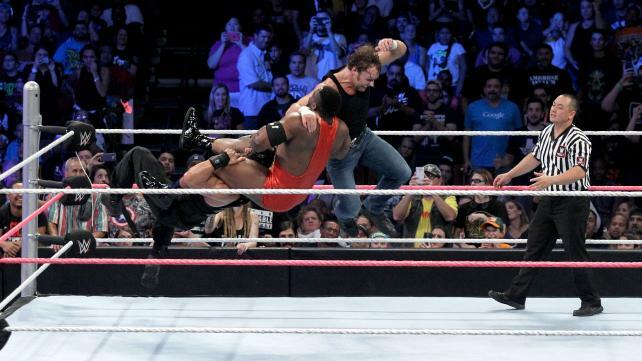 Deans unhinged style, kept Kofi and Big E guessing. Kofi’s high flying and speed allowed him to turn the tides against the formidable Shield brothers (i refuse to say former, because I still Believe!). Big E’s Power matched the power of Reigns but it was not enough. At one point the power of positivity seemed to be drained from the duo, not having the constant cheering from Woods seemed to have a its draw back. Apparently 3 unicorns is what equals the magical win. Kofi and Big E attempted to strategically regroup in the back, but those disgusting, dastardly, table poaching, Xavier Woods abusing Dudley Boyz, forced Big E and Kofi back into a match their heart was not in. They battled on but it was not enough as a Spear from a fired up Reigns allowed the tag team champs to be pinned, and their momentum heading into hell In a Cell suffered. As Roman and Dean celebrated, Bray Wyatt appeared on the screen and again warned Roman that he would have no where to hide come their historical match this Sunday! First, I need to give mad props to Kofi and Big E for finding the strength to carry on with out their mouth piece. Doing what it takes to continue on despite the atrocity that was preformed on their dear friend and brother in positivity, Xavier Woods. I have no doubt that come Hell in a Cell, they will emerge from the battle with the Dudley Boys still with gold around their waists. Second, Bray Wyatt is so in Roman’s head. sure Roman puts on a big show that it should be Bray that should be afraid, but Roman’s Monday actions prove that he is just a scared little boy when faced with a monster such as Bray. No I’m not picking on Reigns at all. I adore and respect him. But he can not truly fathom the evil that he is stepping into the Cell with. He has no concept of what he is about to face and the dark place he will have to go. And over the last few weeks he has caught glimpses of the darkness that will be needed to win over Wyatt and that is what scares him. He knows that he will never be the same once he allows himself to go to that dark place. Why is Dean okay after his feud with Wyatt? Dean embraced that dark place long before he came to the WWE. Roman on the other hand has let his anger be his weapon that fueled the power and strength. To beat Bray Wyatt he will need to embrace the darkness. I’m not convinced he’s ready to delve into the abyss just yet. Yes it’s been a minute since I’ve posted. This was due to moves and relocations. Now that things have settled and returned to a sense of normalcy, I have returned! I will continue to call it a I see it and give my opinion on thing. Disagree with me? cool beans, feel free to leave comments or contact me via the Twitter. And remember, Seth Rollins is the best and I refuse to see or live in universe where this is not true. He is the Future, he is the Man, he is the SAVIOR of the WWE. With that being said, #AngelicHeelIsBack! WWE: Raw 6/29/15 Recap!!! The Champion Shows What True Power Is! This entry was posted on Thursday, October 22nd, 2015 at 11:38 pm	and is filed under Events, News, Television. You can follow any responses to this entry through the RSS 2.0 feed. You can skip to the end and leave a response. Pinging is currently not allowed. « Film Review: ‘The Last Witch Hunter’! You and me and a dark hole. Just like old times, Pretty, you first.